This week is Pumpkin Week! I have so many favorite pumpkin books and pumpkin crafts and activities that I almost didn't think I would be able to put together another one! For our Virtual Book Club for Kids featured book this week we are reading 5 Little Pumpkins by Dan Yaccarino. 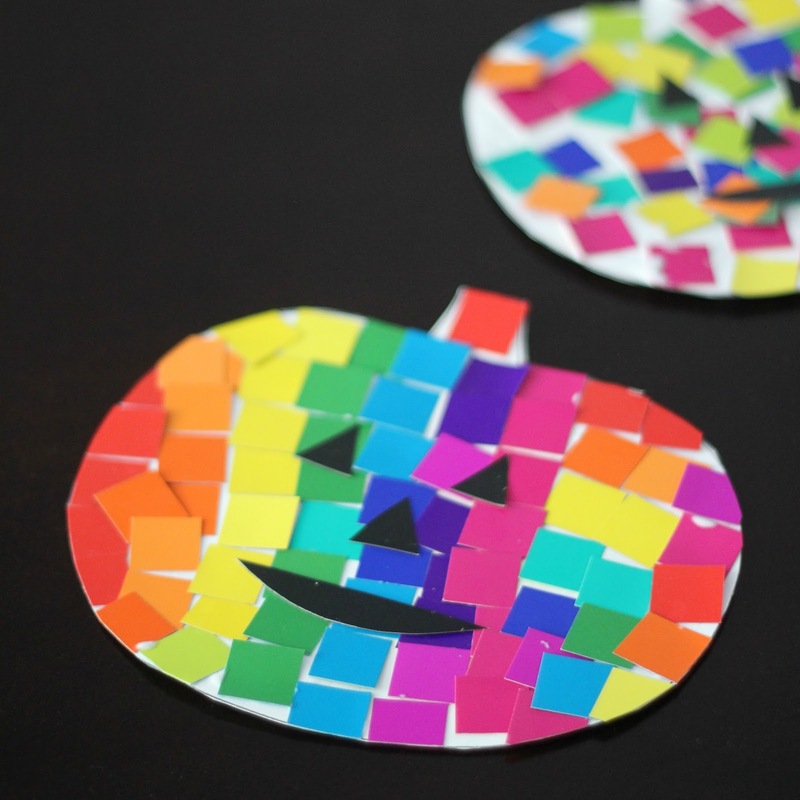 We bought some paper mosaic squares at the craft store recently and thought they would make gorgeous colorful mosaic pumpkins! 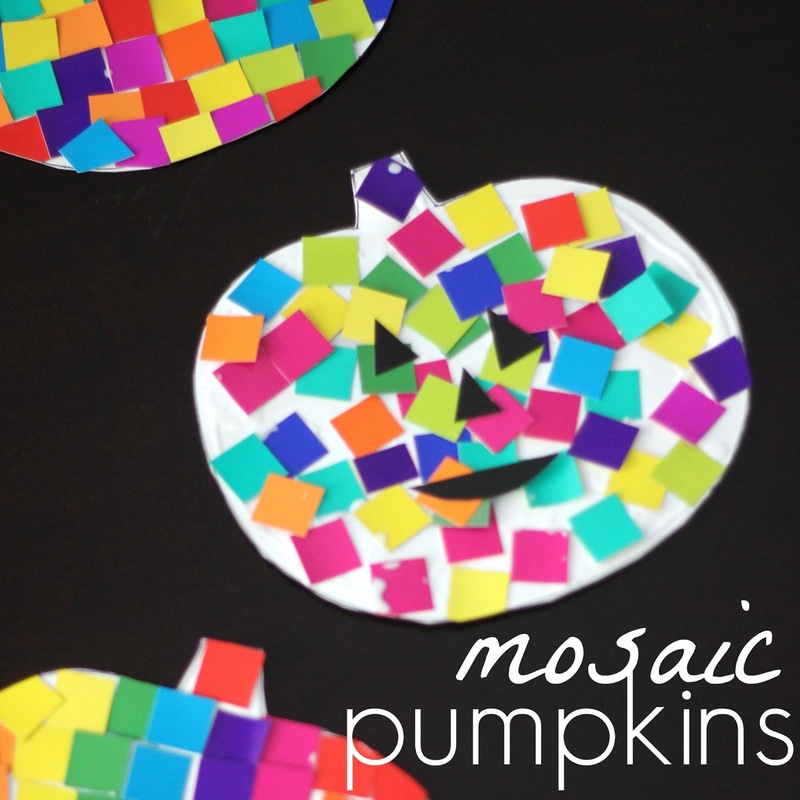 These mosaic pumpkins are so EASY peasy that they are the perfect pumpkin craft for kids (and adults) of all ages. They look beautiful and can be made in so many ways! I joined my kiddos and made my own because it was so simple. I also like to make my own craft sometimes when I am worried that I might try and "help" my kids make theirs look how I want it to look. What I loved about this project was that we could sit around creating together and talking about colors and we could all create at our own levels. My 3-year-old did NOT want to cover his entire pumpkin in colors while my 5-year-old wanted to cover her pumpkin in different shades of colors. I wanted mine to be crazy and have pops of color all over. Here's how we made these. It was so easy. 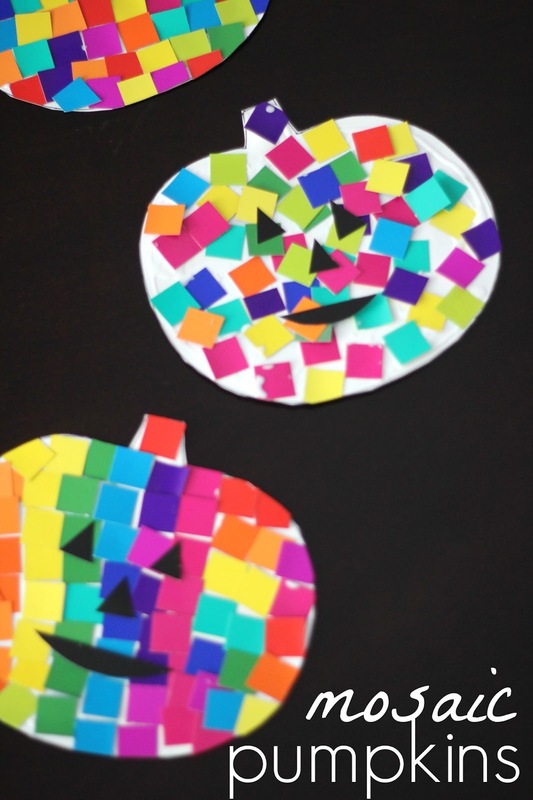 ** If you want to make this harder AND turn it into a more complex fine motor skills focused craft, have your kids cut out their own squares first, before they start creating! Next we covered the pumpkin with white glue. Finally, we started sticking on the mosaic squares! 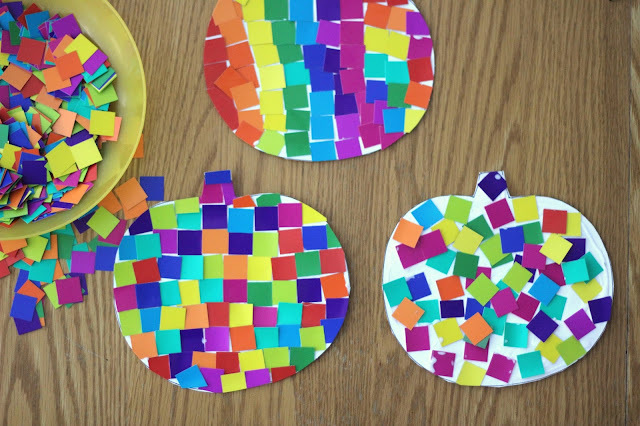 We ended our creating time by adding jack-o-lantern faces to the pumpkins. Our faces weren't too original so we are going to add a few more pumpkins to our collection later this week and jazz them up a bit. If you make one, I want to see yours!! 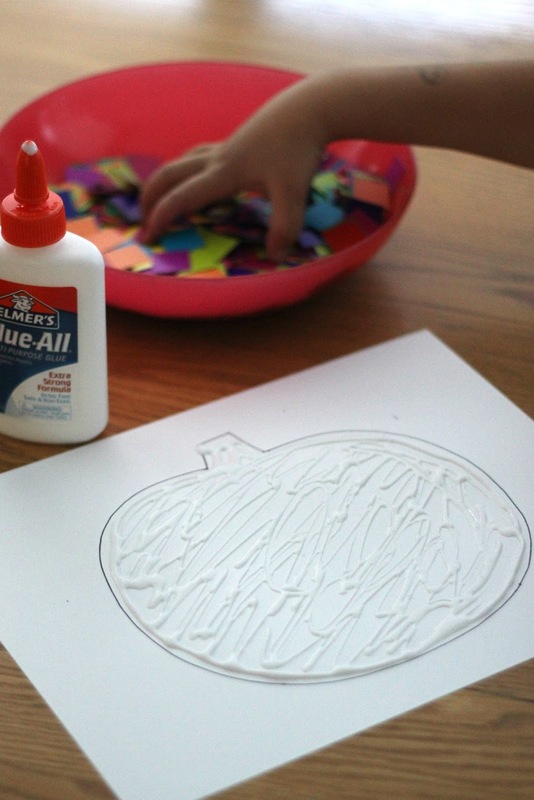 All week long we are going to be reading pumpkin books and doing pumpkin activities! Scroll down for a few of our favorite pumpkin books! Our Weekly Virtual Book Club for Kids co-hosts have put together some fun activities for this week. Check them out below. Click on the links to go to the full tutorials. Come share photos and what you do this week in our facebook group. I love these but then again I love anything RAINBOW! Great idea!